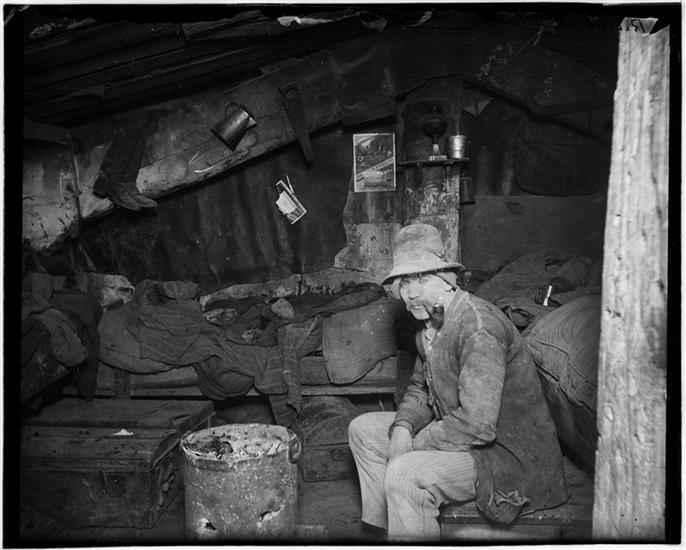 Join us as we bid farewell to our exhibition, Heroes of the Knish: Making a Living and Making a Life. 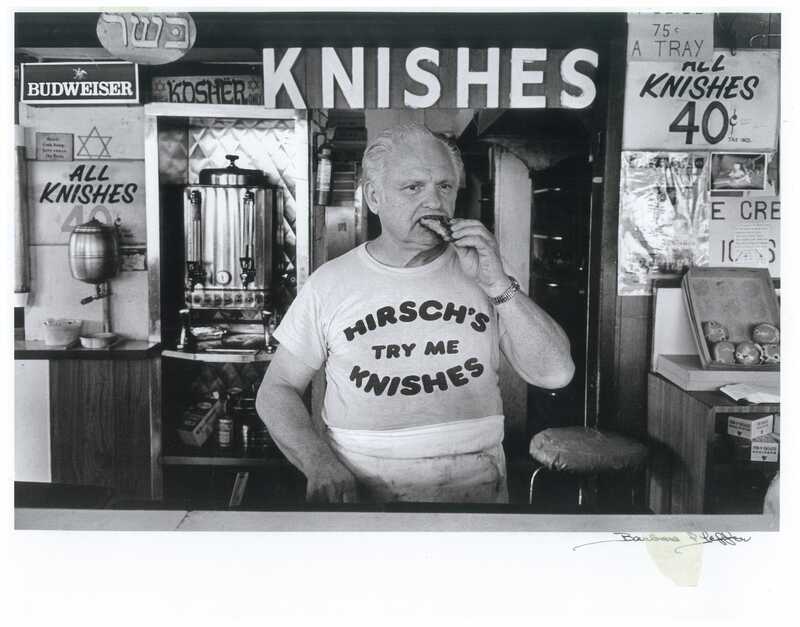 This show traced the history of the iconic New York City street food from its origins in Eastern Europe to its arrival in the US with Jewish immigrants, to its popularization through early knish makers such as Mrs. Stahl, Mano Hirsch, Ruby the Knishman, and Yonah Schimmel. The event will celebrate the knish in style, with live music from All That Jazz (Rachel Levine on vocals, Christopher Bandini on guitar) and a curator’s talk from Laura Silver, author of Knish: In Search of the Jewish Soul Food. We’ll serve an international spread of knishes and knish cousins such as dumplings from Vanessa’s Dumpling House, pierogi from classic Greenpoint spots, and more! To commemorate the 106th anniversary of the Triangle Waist Factory Fire, The City Reliquary will display Robin Berson’s memorial quilt in its front room exhibition space until May 2017. 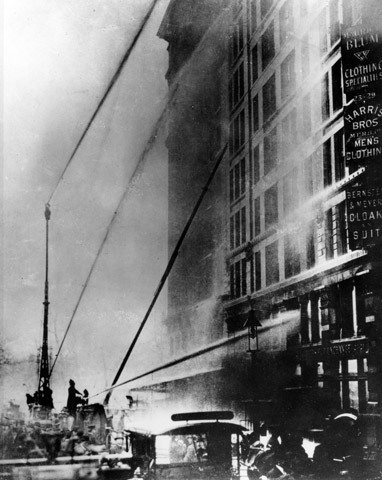 On Saturday, March 25, 1911, at 4:45 pm, almost closing time, a fire broke out on the 8th floor of the Triangle Waist Company located one block east of Washington Square Park at Washington Place and Greene Street. The owners had locked the doors to the stairwells and exits to prevent workers from taking unauthorized breaks and to reduce theft. Fire escapes collapsed by the weight of the workers dropping them to their deaths. 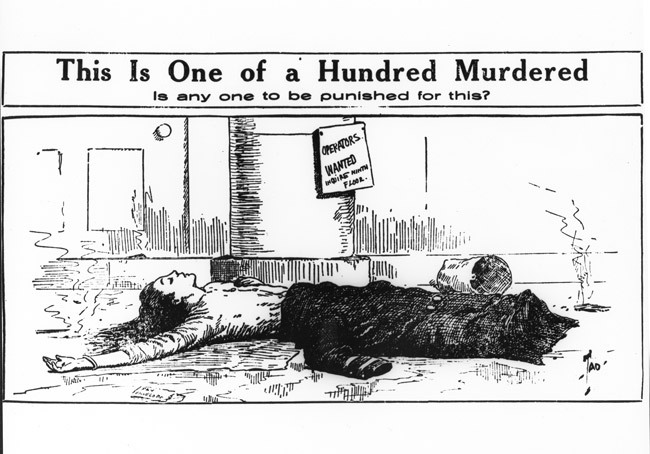 Workers on the 10th floor were warned by telephone and escaped to the roof. No one warned the workers on the 9th floor. A locked exit door trapped the workers on the 9th floor. Surrounded by flames many of the workers jumped to their death. Fire trucks arrived but their ladders only reached the 6th floor and the rescue nets could not hold the force of the bodies jumping from such a height. The heroic elevator operators ran the elevators as long as they could as workers pressed into the cars; some tumbled down the elevator shaft. In the end, 146 people died. The Triangle Fire—and the memorial quilt—represent an appalling moment in history, but one that drew an intelligent, far-reaching reform response across America. 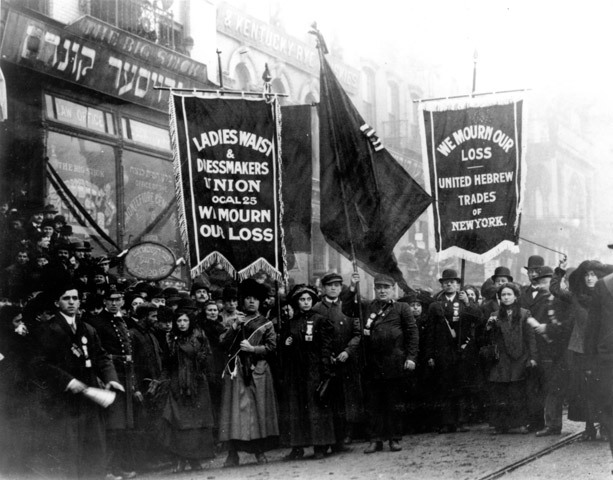 The fire became a rallying cry for the international labor movement and resulted in numerous state and national workplace reforms. Many of our fire safety laws were created in response to this tragic event. That is the history we must keep alive, for the sake of every working person in the country (and, in this globalized world, every worker everywhere). The need is greater than ever. The Triangle Factory Fire Memorial quilt is one of two quilts in the series Workers Memorial Quilts created by quilter, author, and historian Robin Berson. The two quilts honor garment workers who died in twin workplace disasters that bookended the past century: the Triangle Shirtwaist Factory fire of 1911 and the Tazreen fire and Rana Plaza collapse of 2012 and 2013 in Bangladesh. To make this quilt, Robin Berson put out a call to a number of quilters’ guilds, assorted artists’ circles—and quite a few women. The quilt includes blocks by four quilter’s guild members: Sandra Cain, Pauline Hazard, Maureen Hyslop, and Rena Rappaport; two members of Robin’s knitters’ circle: Lea Williams Rose and Deanna Gates; and three students from an FIT class on illustration: Donna Choi, Jennifer Merz, and Genevieve Hitchings. Robin created the rest of the blocks herself, in some cases working from old family portraits and archival photos, but in most cases tinkering elaborately with enlarged images from small photos in 110-year-old newspaper clippings. In addition to the factory worker victims, the quilt also depicts the two heroic elevator operators, Joey Zito and Gaspare Mortilalo; and the African American porter, Thomas Horton. Texts on the quilt include passages from beloved labor songs and quotes from notable American figures on the rights of workers—from Frederick Douglass to Dwight Eisenhower to Myles Horton—plus a listing of all the victims’ names. The memorial quilts have been displayed at numerous small museums and galleries in New York City; the Cathedral of St. John the Divine; Iona College; the Virginia Arts of the Book Center, through the Virginia Foundation for the Humanities. In March 2015 they were featured at the conference of the UN Commission on the Status of Women, hosted by Fordham Law School. For International Women’s Day 2016 they were part of a day-long presentation on the Triangle Fire at Hofstra University. The Triangle Quilt is featured in the book Quilts and Human Rights, with a foreword by Desmond Tutu. Heroes of the Knish covered in the Forward! Our upcoming exhibition, Heroes of the Knish just received this excellent writeup in the Forward! 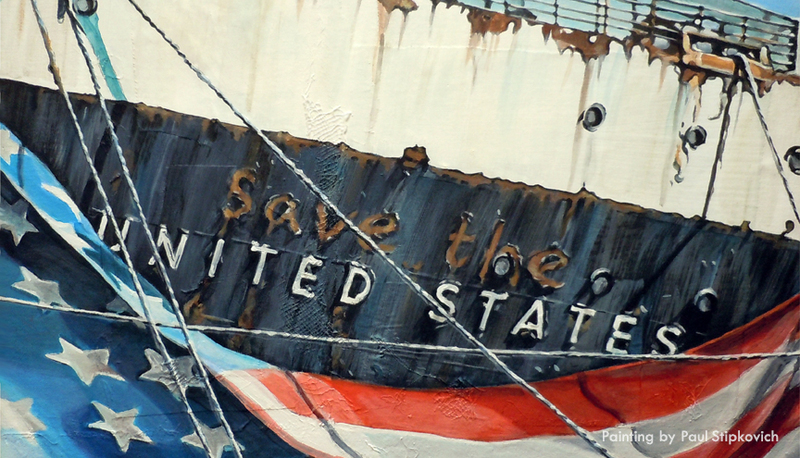 Don’t miss the opening reception this Sunday, Feb. 12 @ 2 PM! The Forward is a periodical delivering incisive coverage of the issues, ideas and institutions that matter to American Jews. Now in its 120th year of operation, and with digital and print editions in both English and Yiddish, the Forward reaches more than 1.2 million average monthly users. Its public service mission is to promote an informed, connected and inspired American Jewish citizenry through outstanding journalism. Posted in Blog, News, Press Coverage | Comments Off on Heroes of the Knish covered in the Forward! At the opening reception on Sunday, February 12, Silver, known as the world’s leading expert on the knish, will deliver an illustrated talk on the sultry side of the potato pie. Aphrodisiac, inspiration for off-color jokes, and fount of feminism, the knish has been a hot commodity in New York City for over a decade. Attendees can cut their teeth on knish trivia while noshing on round and square versions of this classic street food from Knishery NYC and Gabila’s Knishes! Tickets on sale now! Admission includes one knish and pickles. Beverages available by suggested donation. From the Lower East Side of Manhattan to the Brooklyn seaside, the knish has become a standby on sidewalk carts and at ethnic eateries in the five boroughs and beyond. Since its arrival on these shores with Jewish immigrants from Eastern Europe in the early 20th century, the knish — whose origins can be traced to rural Poland of the 1600s — has wedged itself into the hearts, guts, and psyches of New Yorkers of all stripes. 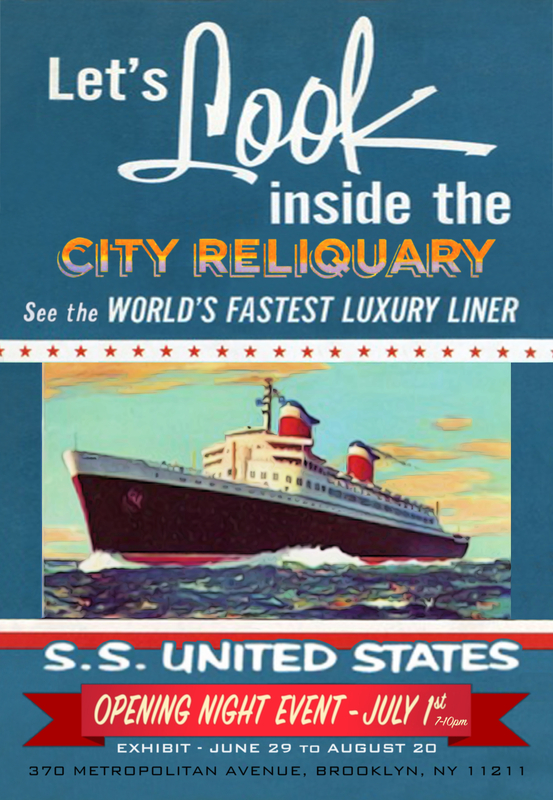 The City Reliquary Museum & Civic Organization preserves the everyday artifacts that connect visitors to the past and present of New York City. It was originally established as an apartment window display in 2002 at the corner of Grand and Havemeyer Streets and relocated to 370 Metropolitan Avenue in 2006. The Reliquary also hosts public events that invite neighbors and visitors to meet, exchange ideas, and celebrate the diversity of our city. 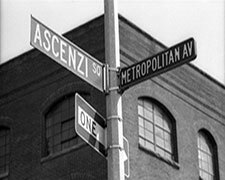 Steps from The City Reliquary sits Ascenzi Square, an unassuming wedge of green space at the intersection of North 4th Street, Metropolitan Avenue, and Roebling Street. This site is often passed over in the daily chaos of the city. Few people use the sidewalk around the space, which is often blocked from view by a car service lineup and ambulances from EMS Station 35. Yet it is a living tribute to the patriotism and sacrifice of four sons of Williamsburgh: the Ascenzi brothers who fought in World War I. Of the four, only two came home. The City Reliquary will chronicle the Ascenzi family and Ascenzi Square through photographs and artifacts loaned by Marion Ascenzi Duckworth Smith, daughter to one of the surviving Ascenzi brothers, Charles. In illustrating the history of the memorial and the family it honors, the exhibit aims to illuminate an obscure part of Williamsburgh history. Curated by Marion Ascenzi Duckworth Smith, a native of Williamsburgh. She now lives in the Lent-Riker-Smith Homestead, the oldest inhabited dwelling in New York City. The front room of the Reliquary will display “Tower Records” during this time. The closing reception for the current Community Collections display, “Joseph Kopitz’s Souvenir Buildings“, will also occur on Sept. 13. Opening donut party celebration: Saturday, December 7th, 6-9 p.m. The delicious new exhibit Keep Your Eye Upon the Donut explores the key moments in the history of donut shops in Brooklyn and Manhattan, and the role New York City played in establishing and popularizing this delicious treat. The city’s rich donut history is surveyed and nine present-day donut shops are profiled. The city’s donut shop history starts with Mrs. Anna Joralemon’s 1673 donut shop on Broadway near Maiden Lane. Significant moments that will be highlighted include: the donuts served to immigrants arriving at Ellis Island, the Salvation Army’s Doughnut Hut in Union Square, the founding of the Doughnut Corporation of America, and the first donut shop chain, Mayflower Doughnuts, which had its flagship shop in Times Square. The nine present day donut shops highlighted are Peter Pan Donut & Pastry Shop, Doughnut Plant, Mike’s Donuts & Coffee, The Donut Pub, Doughnuttery, Dun-Well Doughnuts, Shaikh’s Donuts, Dough, and Carpe Donut NYC. Photographs and histories of each shop will be on view alongside items from these shops. Items from Julie Thomson’s collection of donut ephemera will also be shown. Donut events and programs will accompany this show, along with opportunities for visitors to share their own donut and donut shop memories. 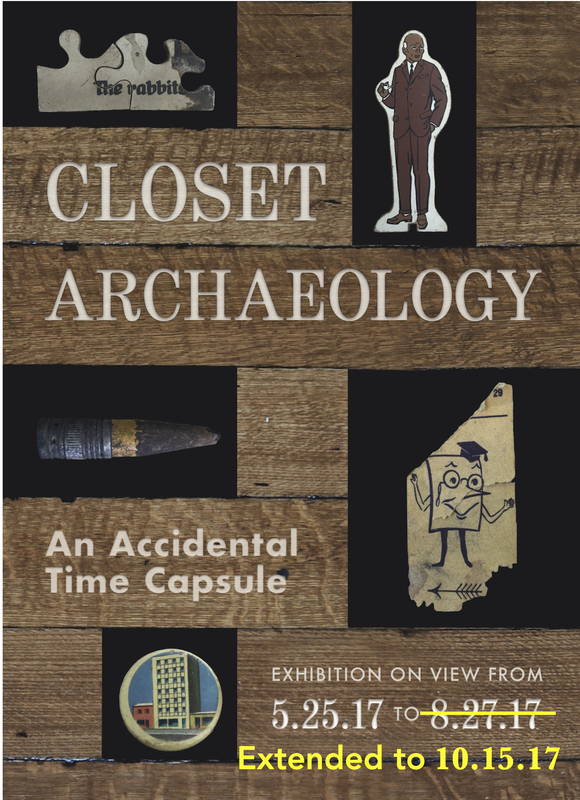 This exhibit is organized by Julie Thomson, a former resident of Brooklyn who now lives in Durham, N.C. where she writes about donuts for Our State and makes audio documentaries including In Search of the Marble Donut. Her donut blog is http://www.donutgrrl.wordpress.com and she tweets about donuts @donutgrrl.